We took a bank holiday trip down to Denbies Wine Estate just outside Dorking yesterday, to give Mini-Viking his first look at where Mummy and Daddy got married. Needless to say, unlike our wedding day, it tipped down with bank holiday rain which made the planned vineyard walk highly impractical. Still, he enjoyed running around inside, and also watching the land-train drive off on a vineyard tour. Fortunately the rain was little hindrance to visiting the new home of Surrey Hills Brewery, around the back of the winery in former storage sheds. The brewery moved here last year after being snowed once too many at its former countryside home, deep in the eponymous hills. 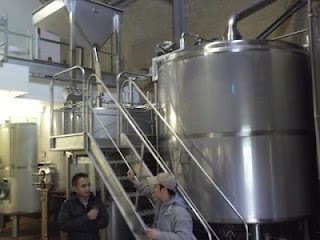 The move also allowed an upgrade from the former 17 barrel plant to a 30 barrel one (copper and mash tun pictured above), enabling them to get ahead of demand at last. There's five fermenting vessels (below), although brewery boss Ross explained that they can't use them fully due to a slightly unusual method of production – after fermentation, the beer is racked off into a second fermenter for two days. He said this isn't really long enough to count as conditioning, but it means that the yeast is more evenly distributed throughout the brew, giving a better result and more even cask conditioning – I guess it kind of homogenises the beer. 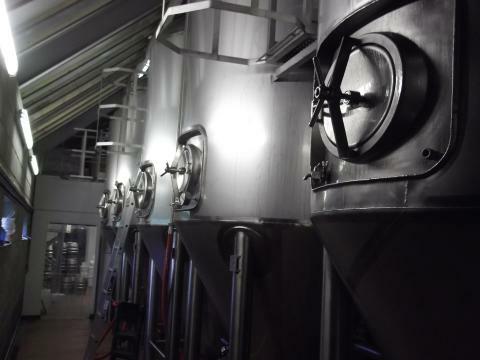 The brewery is open to visitors Monday to Wednesday from 10am-3pm, and Thursday to Saturday from 10am-5pm.On tap yesterday were the two regular beers, Ranmore Ale and Shere Drop, plus the current seasonal, the deliciously hoppy Greensand IPA. They sell the Shere Drop in bottles, and also all their current beers in plastic jugs containing multiples of a quart – we can confirm that a quart of Shere Drop disappears surprisingly quickly!